A short post about the Chinese Labour Corps, because we come across their headstones on rare occasions, as I did a few weeks back, and because it allows me to show you this photograph of a mass of happy Chinese workers, and one seemingly very angry one, en route for Europe in 1917. Britain, France and eventually the United States recruited some 143,000 Chinese workers between them to work in France & Belgium during the Great War, of which the British accounted for the majority, around 95,000. The Russians also used Chinese labour, in numbers estimated at certainly 200,000, and perhaps as many as 500,000, but that, with revolution in the air, really is another story altogether. 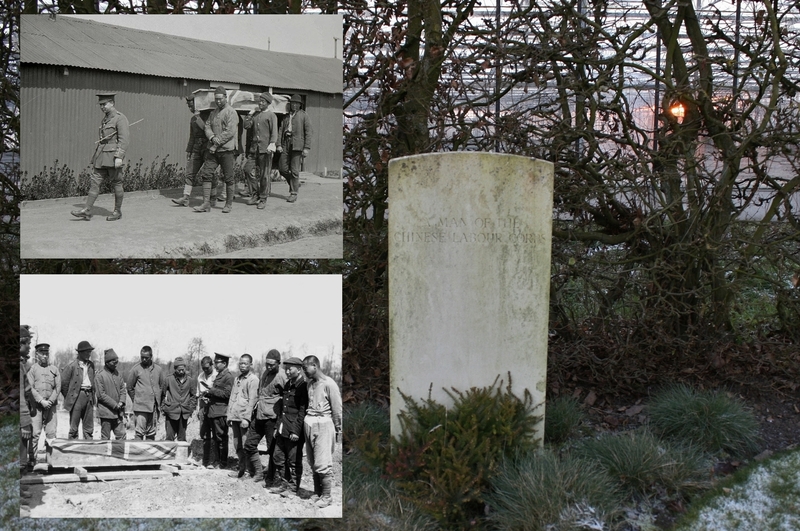 Chinese Labour Corps burial in Klein-Vierstraat Britsh Cemetery, a few miles south west of Ypres. In 1916, the need for more and more manpower (conscription had begun in January) convinced the War Committee in London to sanction the recruitment of Chinese labourers to work in France – other nationalities – Egyptians, Indians, Maltese – had been considered and rejected for a variety of reasons – thus releasing thousands of British troops currently engaged unloading crucial war supplies at the Channel docks for the front lines. The French had paved the way, agreeing a contract with the Chinese Government in May 1916 which would supply them with 50,000 Chinese labourers, the first of whom embarked for Marseilles in July 1916, the French officials involved in the negotiations posing as civilians to protect the Chinese Government’s neutrality. The British, despite problems with the Dock, Wharf, Riverside and General Workers Union (oh yes, even in wartime), who ensured that, throughout the war, no Chinese workers were employed at work back in Blighty, followed suit, and after protracted negotiations, the first contingent of just over 1000 embarked for the United Kingdom on 18th January 1917, three months after recruitment commenced, and on 21st February 1917 the Chinese Labour Corps was officially formed. Interestingly, it would not be until April that the British would form their own Army Labour Corps. Map showing the transportation routes from China to Europe, those to Britain marked in red. In February 1916 the French transport Athos was sunk in the Mediterranean with the loss of 543 Chinese labourers, hence the longer, safer routes shown on the map, yet news of the tragedy did nothing to deter enlistment in China. The inset photos show, clockwise from top right; recruitment in Weihaiwei, a leased territory of the U.K. in north eastern China; embarkation; on board; disembarkation in Vancouver; on the Western Front. A Chinese Labour Corps company would consist of about 500 men, of which the majority would be labourers (privates, if you like), commanded by a British major or captain, along with a number of British officers & NCOs. There would be an interpreter, a Head Ganger (the Company Sergeant Major), Class One Gangers (sergeants), and Class Two & Three Gangers (corporals & lance-corporals). The men were clothed – ‘native-style’ fatigues were issued, but, as the inset photos above show, all sorts of dress were actually worn, along with a fur-lined brown felt hat modelled on British Army headgear worn in the North China garrisons before the Great War – fed and housed, and received a small daily wage, for which they were expected to work a ten hour day, seven days a week, time off for Chinese holidays. This sounds harsh, but was really no different to their working lives back in China and thus was viewed as perfectly normal practice. For what it’s worth, my educated guess is that the front row of the centre inset shows, from the left, the Head Ganger, a Class One Ganger (Gangers wore chevrons on their sleeves), with the Interpreter on the right. 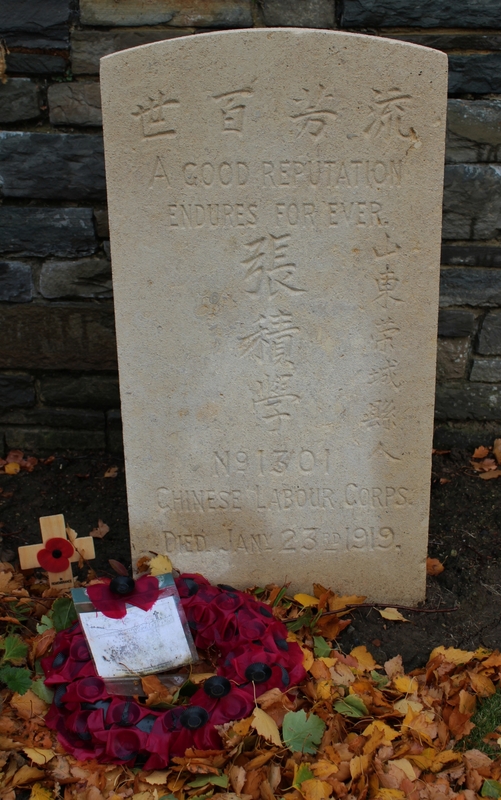 Chinese Labour Corps grave at Kezelberg Military Cemetery, ten miles east of Ypres, one of the very last cemeteries to be made before the end of the war, the earliest burial taking place here on 25th October 1918, and the last on 12th November. As the war continued Chinese workers were employed not only at the docks, loading and unloading, but in repairing roads, laying railway tracks, various forms of construction work, levelling land for new airfields and so on. Some began operating vehicle repair shops, smithies and paint shops, others helped to maintain artillery pieces, serviced tanks, and some seventy of the more skilled workers were responsible for the application of tank camouflage. After the war millions of shell holes waited to be filled, unexploded ordnance unearthed, and bodies retrieved as the battlefields were cleared, and the Chinese more often than not got the job, a few paying the price. 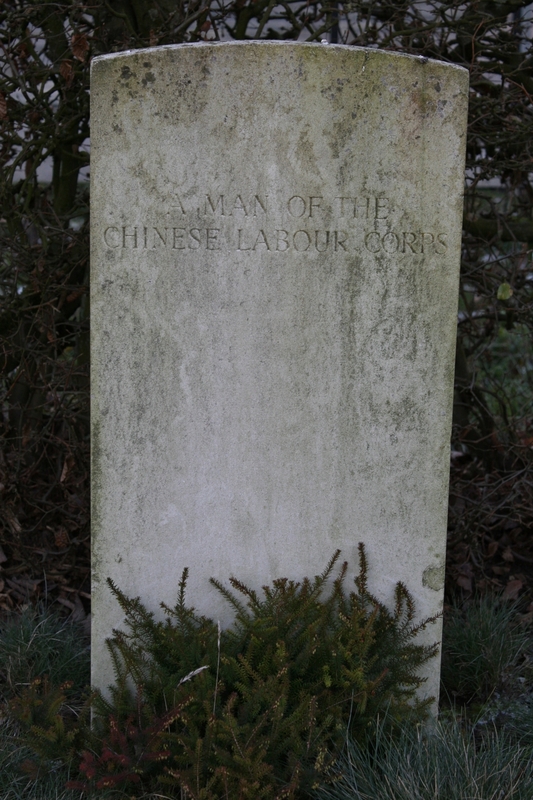 The most recent Chinese Labour Corps burial I have come across, this man lies in Croonaert Chapel Cemetery, a few miles south of Ypres, and, I would have thought, was highly likely to have been the victim of an accident, bearing in mind the date of his death and his isolated place of burial. According to French & British records, I gather (I have not seen them) about 2,000 Chinese Labour Corps workers died during the Great War and in the months following the Armistice, most succumbing to the flu pandemic and other diseases, some as the result of enemy action (on the night of 4th September 1917, for example, the Germans dropped bombs on the Chinese camp at Dunkirk, killing fifteen and wounding twenty one) or injuries received in the course of their work, and undoubtedly some died during post-war battlefield clearance. Fifteen would be sentenced to death for murder, of which, as far as I can see, ten were executed, and there were a number of incidents in late 1917 at Chinese camps that ended in the deaths of over forty labourers, as on each occasion British troops attempted to regain control. 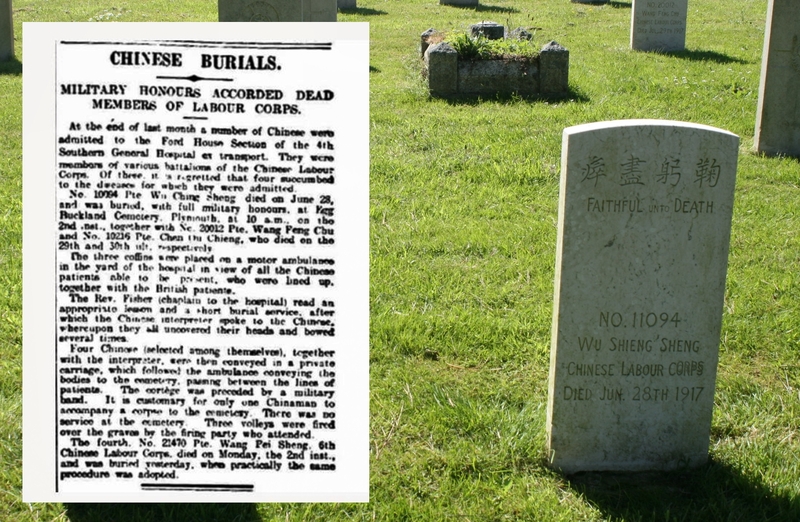 Efford Cemetery in Plymouth, south west England, contains the graves of eight Chinese workers, the largest group of Chinese Labour Corps burials in the United Kingdom. These men died between 28th June & 22nd August 1917, and they were not, as you might think, injured or sick men evacuated from France to hospital in England, as I shall now explain. Wang Fengzhu (Wang Feng Chu), who died on 29th July 1917 of gastritis, aged 37. Between April & July 1917 over 9,000, or 10% of the total number of Chinese workers recruited by the British during the war, arrived in Devonport and Plymouth after a three month journey across both the Pacific & Atlantic Oceans, with a trip across North America or through the Panama Canal thrown in for good measure. 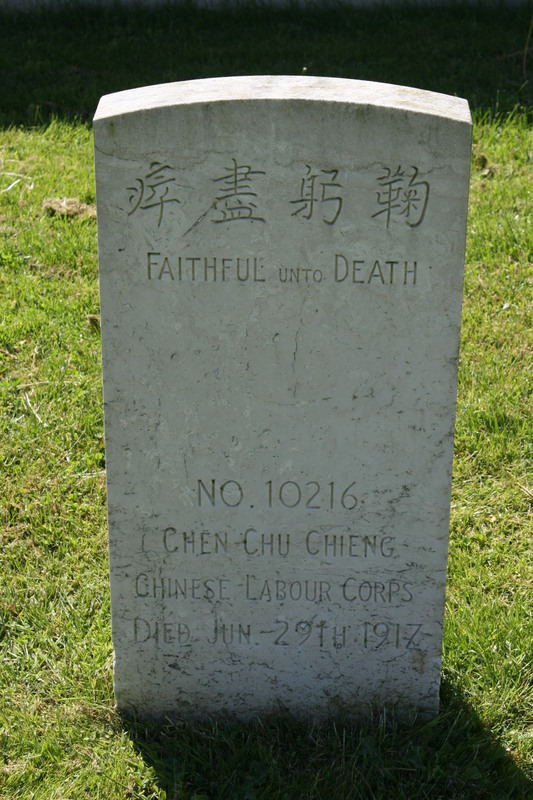 Zhang Enqing (Chen Chu Chieng), who died on 29th June 1917 of beriberi at the age of 24. Conditions on the long journey were overcrowded and dark, food inadequate, and, for diplomatic reasons, train stops when crossing Canada infrequent. 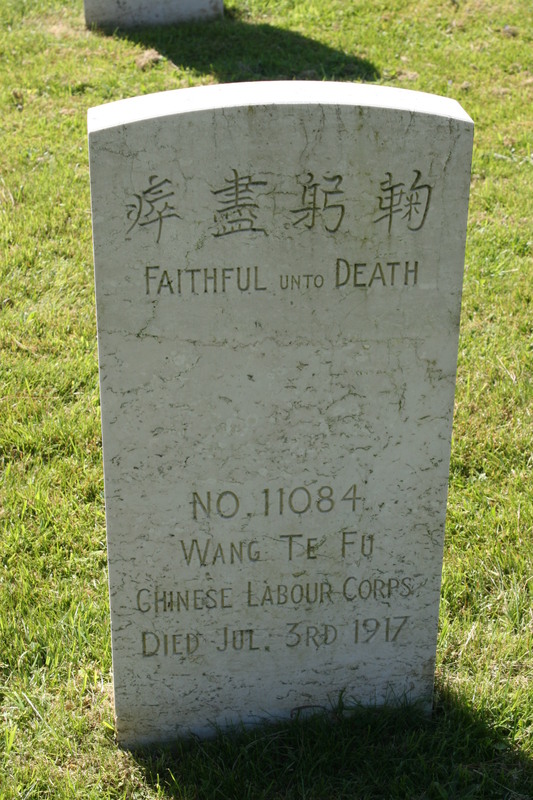 Wang Defu (Wang Te Fu), who died on 3rd July 1917, also of beriberi, at the age of 30. The dangerous Atlantic crossing then took a further toll, and by journey’s end, perhaps unsurprisingly, the men’s health was suffering; sick men were taken to the nearby Ford House Military Hospital, where these eight men would subsequently die. 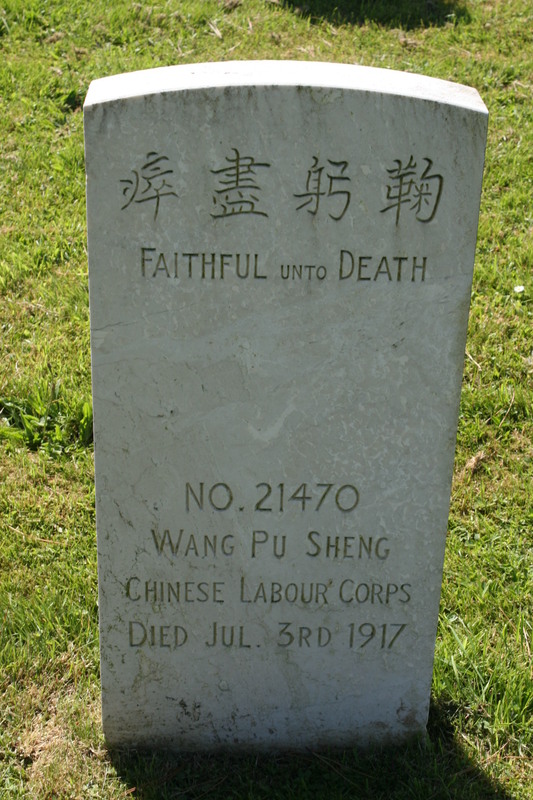 Wang Peisheng (Wang Pu Sheng), who also died on 3rd July 1917, of gastritis, aged 45. , All eight were buried here with full military honours, while the rest of the Chinese Labour Corps crossed the south of England to the port of Folkestone, from where they would embark for France. 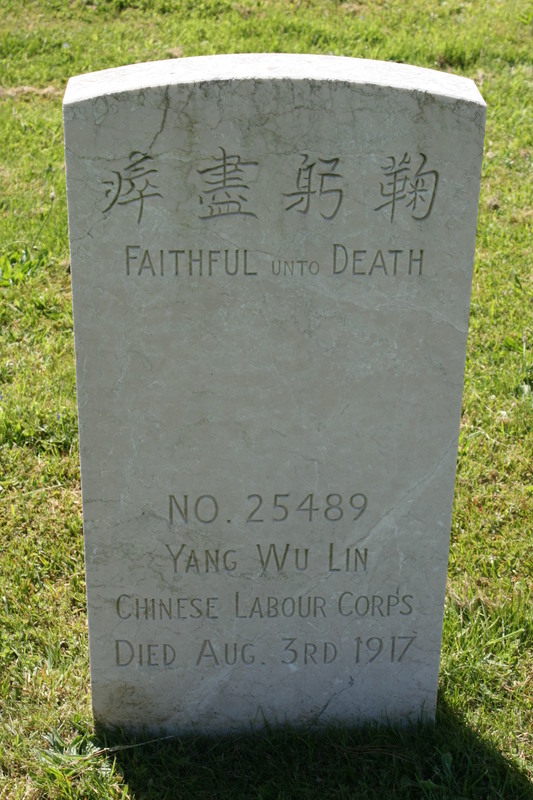 …lies the body of Yang Meilin (Yang Wu Lin), who died on 3rd August 1917 of pneumonia, age unknown. You will have noticed by now that all these Plymouth headstones are inscribed with the Chinese idiom ‘Faithful unto Death’, one of four (maybe five) epitaphs used on Chinese Labour Corps headstones; two others, ‘Though Dead He Still Liveth’ & ‘A Good Reputation Endures Forever’, can be seen on the earlier headstone shots in this post, the remaining two being ‘A Noble Duty Bravely Done’ & ‘True till Death’, although exactly why that is different – it isn’t, is it? – to ‘Faithful unto Death’ beats me. 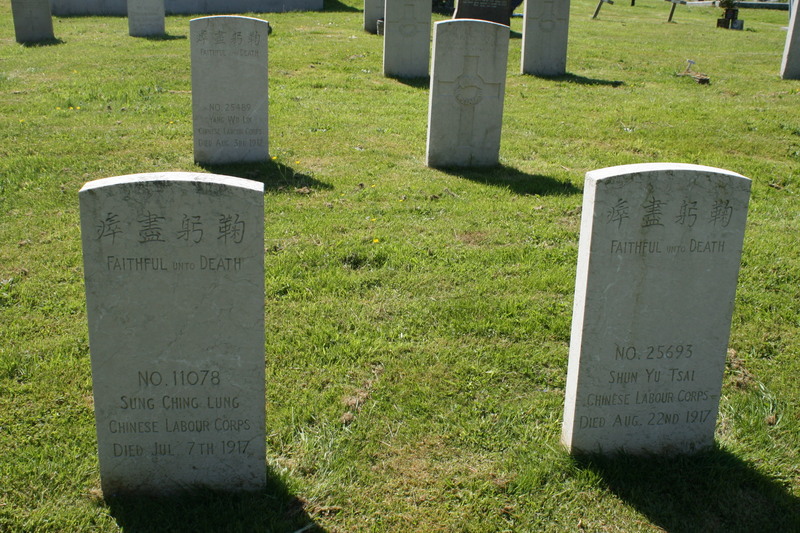 Interesting too that all eight men buried here in Plymouth are identified by their names in English, yet all three of the earlier headstones in Flanders that I showed you are identified by numbers only, unless you speak Chinese. 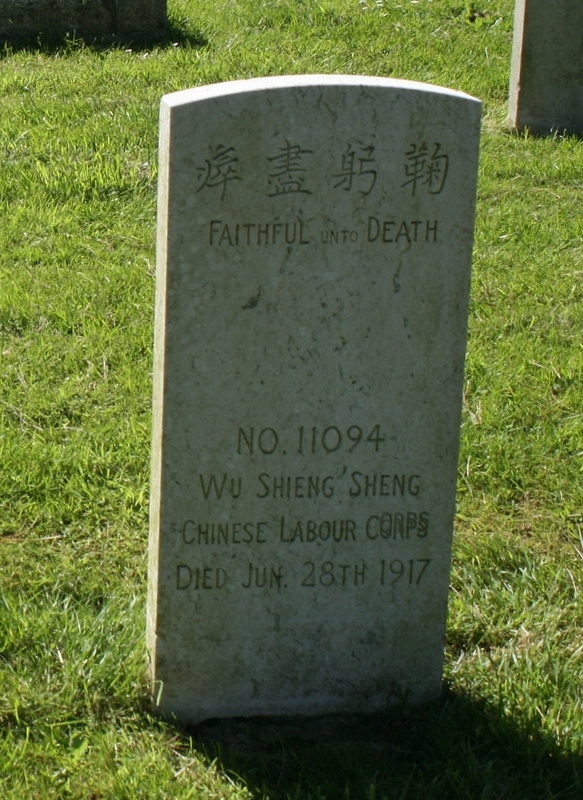 Finally, and the earliest burial of all, this is the grave of Wu Jinsheng (Wu Shieng Sheng), aged 24, who died on 28th June 1917 of dysentery. The numbering on Chinese headstones seems to suggest that, on enlistment, the labourers were simply each given consecutive numbers, presumably the very first man to enlist getting the number one, and the last the number 95,000, or thereabouts. 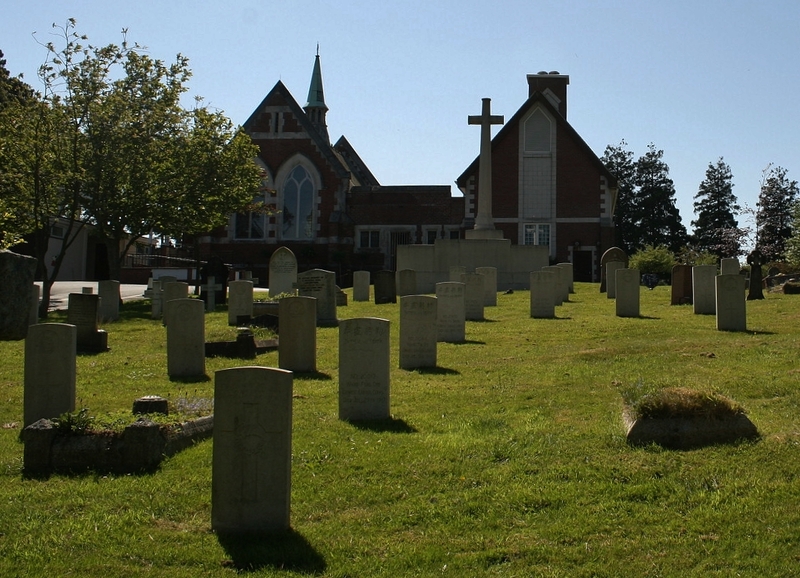 This seems to make sense; the graves here at Efford Cemetery, all are summer 1917 casualties, and are numbered between 10,216 & 25,693, all relatively early numbers. 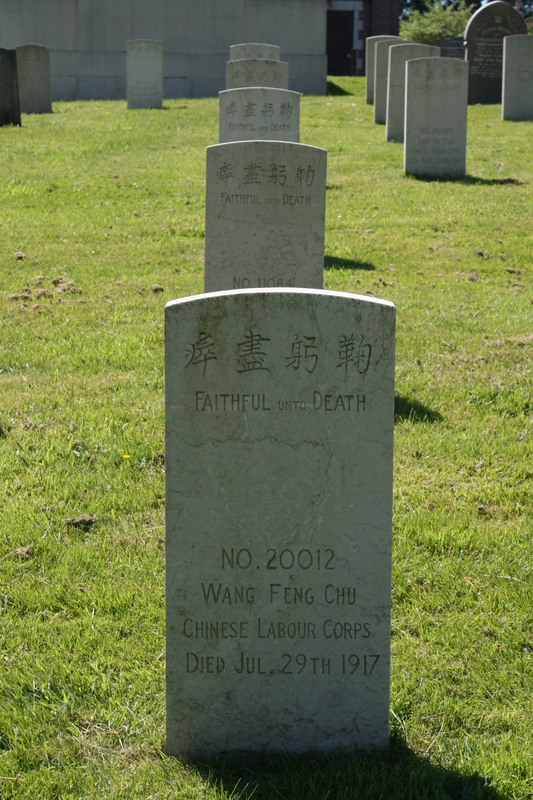 The most recent Chinese Labour Corps man I have visited, at Croonaert Chapel Cemetery, died in January 1919 and his number, 91,301, suggests that he was one of the last men to enlist. Recruitment ended for the French in January 1918, and for the British in April. Location of Chinese Labour Corps factories and workshops in France, the British contingent, by far the largest, don’t forget, all clustered at the top of the map. The inset photographs show, from top, two Chinese workers hosing down a Mark V tank under supervision at the Tank Central Workshops in Erin near St. Po, and Chinese Labour Corps men at work unloading grain at the Channel ports. 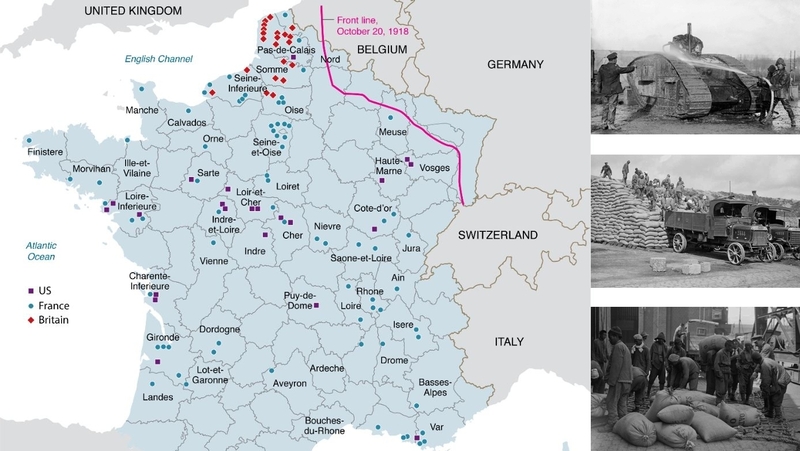 The two maps in this post are from a publication entitled ‘Les travailleurs chinois en France dans la Premiere Guerre mondiale, CNRS editions, 2012’, via the South China Morning Post. Never let it be said that I don’t do my research! 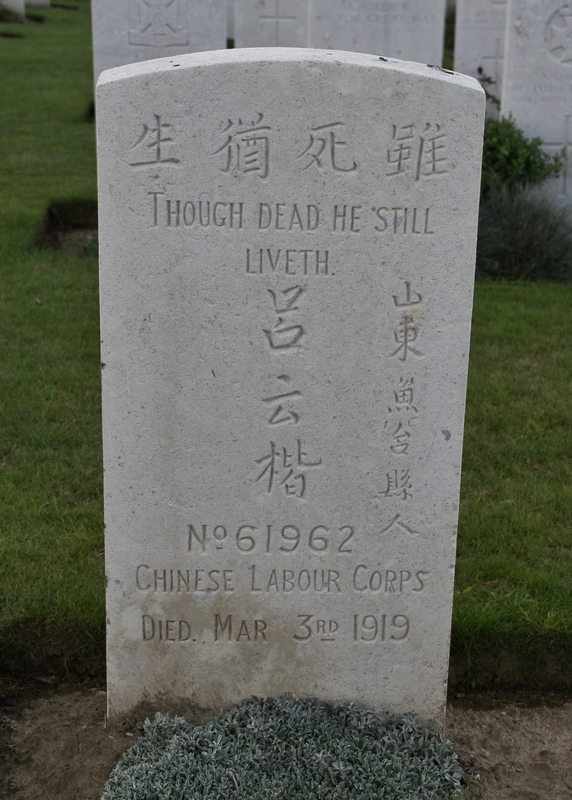 The grave of an unknown man of the Chinese Labour Corps in Laventie Miltary Cemetery in northern France – no name, no Chinese idiom, no Chinese whatsoever. 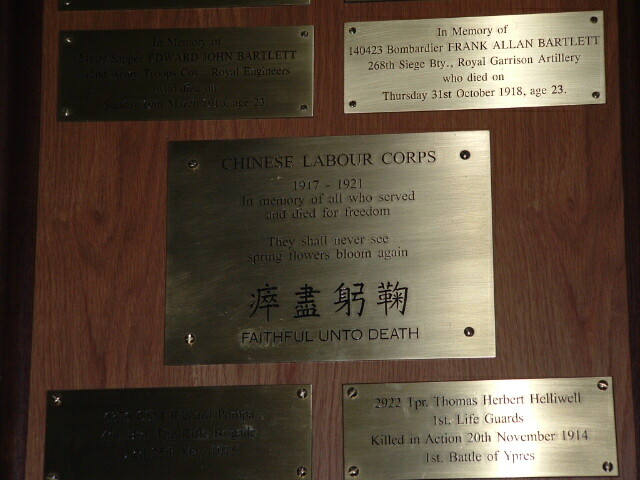 The small plaque in St. George’s Church in Ieper (Ypres) remembering the men of the Chinese Labour Corps who died between 1917 & 1921. The first Chinese repatriations began a few days before the war’s end, but there were still Chinese Labour Corps workers in Europe in 1921 (a couple of hundred had even gone with the British to North Russia in 1920). Some Chinese workers would choose to remain rather than return to their homeland – those working for the French had the right to remain included in their initial contracts. 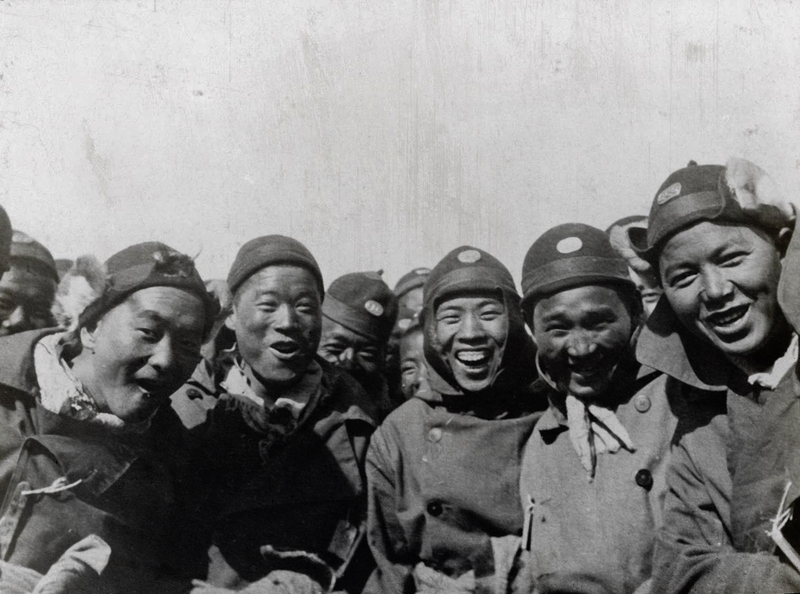 Laughing Chinese Labour Corps men wearing the ‘Shandong’ hat described earlier, some sporting the official Chinese Labour Corps cap badge (oval, copper, embossed with the letters C.L.C. – see also the title photo of this post). There’s a book, an easy read, published in 1919 by a British subaltern with the C.L.C. (and with a title that would be unacceptable today) that outlines the rigours of the journey for the men of the Chinese Labour Corps to Europe, and you can grab a free digital copy here should you wish. Ain’t I good to you? And it is good to note that the men of the Chinese Labour Corps are not forgotten to this day, as this invitation to the inauguration of the Chinese Memorial Site at Poperinge in November 2017 shows (thanks to Morag for sending me the scans). Well I know where all the burials are – sixteen locations in Belgium, including at least four of the Poperinghe cemeteries. How were they treated by the locals, because the expression on the face of the lady on the left of the Langemark Chinois photo near the end speaks volumes. When you find the invite, it’d be good to add a scan to this post. Maybe? Good morning. I will dig it out and take a photo of it as I don’t have a scanner. Annemie Morrisse in charge of the Lijssenthoek project did a lot of work on the Chinese. We had a delegation stay when we were wardens. Nothing came at thst time but attitudes changed with the anniversary commemmorations I guess. I am away to church shortly but will look out the invitation. How do I post it on here though? 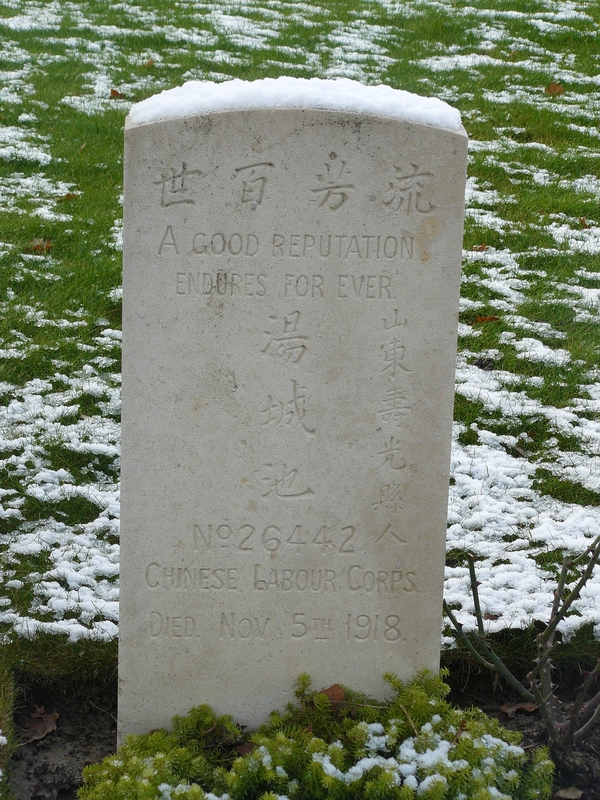 The In From The Cold Project (IFCP) has had 94 men from the Chinese Labour Corps added to CWGC’s database in the last few years. And a good job too, we say. 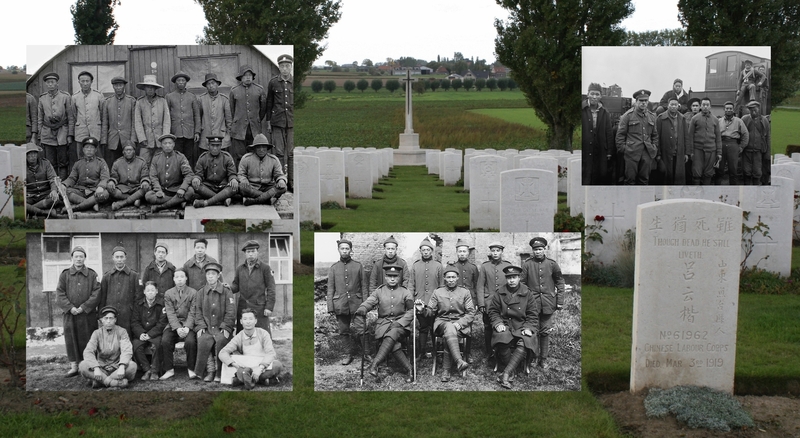 In the Reninghelst New Military Cemetery are 7 Chinese Labour Corps men. There were 6 men in 75th Company and 4 of them were killed same day, 12 April 1918, with numbers 33774, 33776, 33795 and 35728. Likely a shell? Yes, I just took a look myself – the overtype seems to be 1918, don’t you think? The other four, yep, likely a shell or a munitions accident, perhaps. I truly appreciate this post drawing attention to the work of the Chinese Labour Corps in WW1. They are often under-appreciated. While outside the ambit of WW1 many do not realise the incredible loss of Chinese worker lives that occurred also in WW2. Just one example, the infamous Thai-Burma Death Railway. Along with other “civilian Asian workers” some 90,000 perished. I purposely exclude here Allied POW deaths. They were all treated abominably. With their natural propensity to work in harsh extreme conditions where others could not, to put it politely, Chinese workers were “exploited” in many places around the world. Without them, many great infrastructure projects would not have been completed. We must thank them for their efforts including in WW1 and thank you Magicfingers for providing an insight to these labourers. And thank you Sid and well said – thought this one would be of interest. They are indeed often under-appreciated, but perhaps things are slowly changing now. I hope so. Then of course there were other places who supplied labourers; one that comes to mind is the Manipur region of India (Imphal is right in the middle of the region, Kohima to the north), etc etc., and these men are totally forgotten, it seems – I only know about them from IWM photographs I’ve seen. 21st century China has certainly changed! Adding to your Manipur region comments, more than 180,000 “South East Asian workers” (romusha) were recruited under false pretenses or forcibly drafted to work on this railway. Included were 100,000 Malayan Tamils of Indian origin (those to whom you refer?) of whom around 60,000 perished. Wheat eating Chinese were fed rice which contributed to sickness and death. The deadly “Coolie Camps”, as they were called, were separate to others. Yet many of these virtual prisoners showed extraordinary kindness to sick British prisoners passing down the river. The CWGC Kanchanaburi War Cemetery containing 6,982 allied POWs is a moving experience and one needs visit the nearby JEATH War Museum (the one in a recreated typical POW barracks) where exhibits are not “sanitised,” to understand why so many of that generation (my English mother-in-law included) would not buy or use Japanese products for decades after the end of WW2. I don’t know whether the Malayan Tamils are originally from Manipur. But I am referring to Great War workers; I presume you are talking WW2 here? There is a 1970s song by a band called Spirit that ends with ‘and today we buy Datsuns & Sonys’ which is referring to what you say at the end of your comment – well, suggesting that now we all buy Japanese products, as opposed to don’t, but you get the idea.